Just like the swallows return each year to Capistrano, I eagerly await the Congressional Budget Office’s release of its annual Economic and Budget Outlook. But not just because I’m a fiscal wonk. I also like perusing this publication to find CBO’s “baseline” forecast for government revenue over the next 10 years. We’ll start by going to page 2 of the report, which reveals that federal tax revenue (assuming there are no changes in law) will grow from $3,189 billion this year to $5,029 billion in 2025. Over that ten-year period, revenues will grow each year by an average of 4.67 percent. So, at the risk of stating the obvious, this means that red ink will increase if yearly spending increases by more than 4.67 percent, but it also means that the deficit will fall if the burden of federal spending grows by less than 4.67 percent each year. Indeed, we can easily calculate how easy it is to achieve fiscal balance. Simply take CBO’s estimate of federal spending for the 2015 fiscal year, $3,656, and then look at what happens based on various assumptions for future spending growth. A spending freeze means the budget balances in 2018. If federal spending increases by 1 percent each year, we balance the budget in 2019. 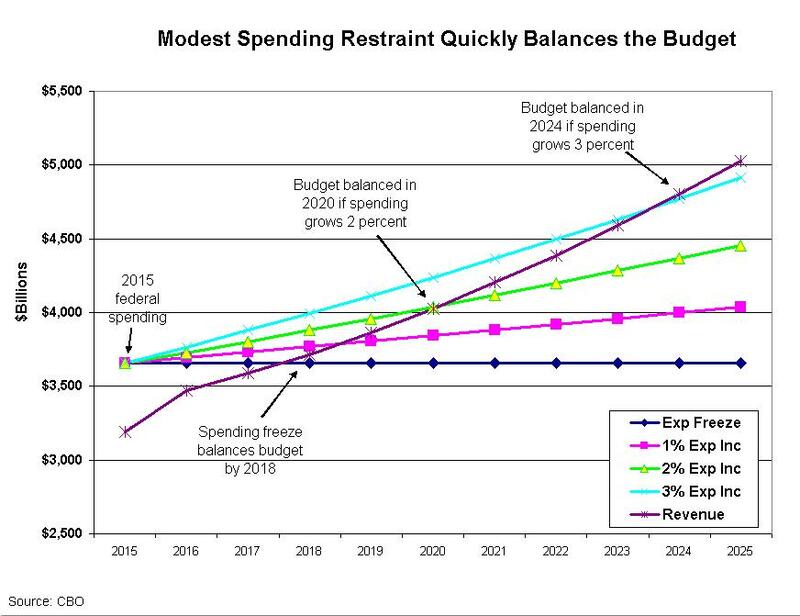 If federal spending climbs by 2 percent each year, we balance the budget in 2020. And if federal spending jumps by 3 percent each year, we balance the budget in 2024. Here’s a chart showing these options. Now let’s explore three implications of this data. First, there is no need to cut spending. It would be good to impose genuine spending cuts, to be sure, but progress is possible so long as spending grows slower than revenue. And the real goal should be to make sure that spending grows slower than the private sector. Second, there is no need to raise taxes. A lot of beltway types would like voters to believe that our fiscal problems are so huge that tax increases are both necessary and desirable. That’s obviously wrong. Indeed, tax hikes almost surely enable more spending rather than deficit reduction. Third, when Washington insiders assert that tax increases are needed to preclude “savage” and “draconian” spending cuts, they’re using the dishonest DC definition of a “cut,” which is when spending doesn’t rise as fast as previously forecast. The main problem is that politicians generally don’t like spending restraint. Between 2000 and 2009, for instance, they let spending grow nearly four times faster than revenue. That being said, we’ve actually made progress over the past five years thanks to a nominal spending freeze. ** And as outlined above, we can make more progress in the near future with a few more years of modest spending restraint. The real key is whether we can maintain fiscal discipline. In the long run, there’s very little hope of spending restraint unless there’s genuine entitlement reform. And getting that type of reform probably won’t be possible if politicians think they can just raise taxes instead. Particularly a value-added tax, which the European evidence shows is a money machine for bigger government. Probably the best way of getting good policy would be some sort of long-run spending control process, akin to the Swiss Debt Brake. If politicians know they can only increase spending by, say, two percent each year, that will encourage them to finally prioritize the budget and make some long-overdue reforms. *As I have written, over and over again, restraining the size and scope of the federal government should be the main goal of fiscal policy. Deficits and debt are undesirable, of course, but they’re best viewed as symptoms of the real problem, which is too much spending. ** The good news is that spending grew very slowly beginning in 2010. 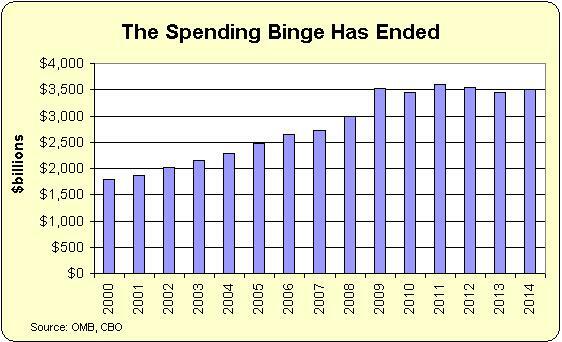 The bad news is that spending rose so fast last decade (particularly in 2009) that the burden of federal spending is still much larger than it was when Bill Clinton left office. This is true. Until our leaders decide that they don’t give a damn about the fact that they are spending the U.S. into bankruptcy. You allude to the fact that the Feds now define a “spending cut” as an increase in the rate of spending of less than what somebody asked for. I wish I could use this definition on my income taxes. Like, I asked my boss for a $5,000 raise. He only gave me a $2,000 raise. So that means I took a pay cut of $3,000. I should be able to deduct that loss on my taxes. DJM also has a good point. With the debt as high as it is and growing, it seems only a matter of time before the ground beneath us disappears and we are left temporarily hanging in the air like a cartoon character. Good post by the Good Zorba. I, too, question the validity of the revenue projections on the same basis. Dan, while the sequester certainly helped reduce the deficits, you need to factor in the abnormally low interest rate regime we’ve had over the same time period to get an accurate picture of what lies ahead. We’ve accumulated a lot of debt over the past decade. But unsustainably low interest rates have kept us from entering the same debt-service death spiral we can now see on display in Greece. I suppose it’s possible this can continue for decades more a la Japan, but it seems unwise to count on that. Revenue increase by 4.67% per year? I imagine that is in nominal terms. So that would be about 3% true annual revenue growth in inflation indexed terms. But for revenue to perpetually increase by 3%, there must be an underlying 3% growth trendline. Otherwise revenue as % of GDP keeps growing, the economy quickly loses worldwide competitiveness and then you get European levels of growth,… further inevitable attempts to sustain government spending by increasing taxation as % of GDP,… even slower growth… the death spiral. So how is this 3% annual growth trendline going to materialize? Are we still on the traditional 3% American growth trendline? After all the layers of statism that have been imposed in the last few years? America’s free market advantage to the rest of the world had already worn quite thin before the financial crisis. Now — after American voters decided to turn to statism to address the bubbles and distortions precipitated by statism in the first place – America’s free market advantage to the rest of the world must be paper thin, if an advantage exists at all any more. One good indication is America’s sliding ranking on the index of economic freedom of the world. At a time when three-four billion people on the planet are awakening from the statist slumber that kept them uncompetitive and poor for centuries, America follows the European countries it once rebelled against into a new statist descent! I think the 3% annual growth trendline is history (not to mention that 3% in today’s world is still not enough to keep the delusional American middle class in the world’s top 10% — as they have now been accustomed to for 2-3 generations – and you can imagine what the European 1% growth trendlines do). The point of no return has passed for America too. Unfortunately Europe’s still unfolding lesson in the link between statism and decline is not coming soon enough to warn Americans. The pivotal point of no return has passed for America too. Electoral dynamics and the politico-economic vicious cycle are for Americans to increase self-submission to statism, regardless of whether this increase in coercive collectivism is brought upon by the Donkeys or the Elephants… who are gradually morphing into Hollandes and Sacrcozys. As statism increases, Americans will increasingly vote like their European brethren. The vicious cycle has closed, American social capital has converged to the world average — the death spiral seems inevitable.